Islam in China – Is the West ready for Islam? Throughout the history of Islam in China, Chinese Muslims have influenced the course of Chinese history. Chinese Muslims have been in China for the last 1,400 years of continuous interaction with Chinese society. Muslims live in every region in China, as China is home to a large population of Muslims. Islam in China has a rich heritage. Islam was first introduced in China in 616-18 AD by Sahaba (companions) of Muhammad namely Waqqas (Sad ibn abi Waqqas), Sayid, Wahab ibn Abu Kabcha and another Sahaba. Wahab ibn abu Kabcha (Wahb abi Kabcha) might be a son of al-Harth ibn Abdul Uzza (known as Abu Kabsha). See the text: “The Prophet was entrusted to Halimah…Her husband was Al-Harith bin Abdul Uzza called Abi Kabshah, from the same tribe”. It is noted in other accounts that Wahab Abu Kabcha reached Canton by sea in 629 CE. Sa`ad ibn Abi Waqqas along with three Sahabas, namely Suhayla Abuarja, Uwais al-Qarni (594-657), and Hassan ibn Thabit (554-674), went to China from Persia in 637 for the second time and returned by the Yunan-Manipur-Chittagong route, then reached Arabia by sea. Some date the introduction of Islam in China to 650 AD which is the instance of third sojourn of Sad ibn abi Waqqas to China, Sa`ad ibn Abi Waqqas, was sent as an official envoy to Emperor Gaozong which was his third sojourn during Caliph Uthman‘s era in 651 AD. Throughout the history of Islam in China, Chinese Muslims have influenced the course of Chinese history. 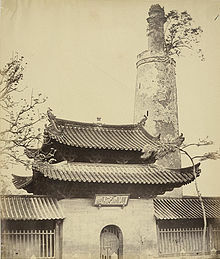 Guang Ta minaret, Huaisheng Mosque, Guangzhou, China. 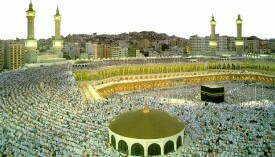 According to tradition, the mosque was founded in 627. The minaret was built in the 10th century. Photograph by Felice Beato, April 1860. Earlier visits of Sa’d ibn abi Waqqas were noted in Arab accounts since it was a period of nascent Islam mixed with events of many hectic preaching and warfare. They (Sahabas) were more concerned with writings of verses of the Koran as revealed to Muhammad, and his sayings (hadiths) and ways of life (sunnah). 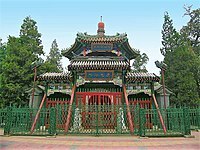 According to China Muslims’ traditional legendary accounts, Islam was first brought to China by an embassy led by Sa’d ibn abi Waqqas that was sent by Uthman, the third Caliph, (that was in 651, less than twenty years after the death of Muhammad) which are confusions with Sa’d ibn abi Waqqas’s earlier visits. The embassy was led by Sa`d ibn Abī Waqqās, the maternal uncle of Muhammad himself. Emperor Gaozong, the Tang emperor who received the envoy then ordered the construction of the Memorial mosque in Canton, the first mosque in the country, in memory of Muhammad. While modern secular historians tend to say that there is no evidence for Waqqās himself ever coming to China, they do believe that Muslim diplomats and merchants came to Tang China within a few decades from the beginning of the Muslim Era. The Tang Dynasty’s cosmopolitan culture, with its intensive contacts with Central Asia and its significant communities of (originally non-Muslim) Central and Western Asian merchants resident in Chinese cities, which helped the introduction of Islam. The first major Muslim settlements in China consisted of Arab and Persian merchants. During the Tang and especially the Song eras, comparatively well-established, even if somewhat segregated, mercantile Muslim communities existed in the port cities of Guangzhou, Quanzhou, and Hangzhou on China’s southeastern seaboard, as well as in the interior centers such as Chang’an, Kaifeng, and Yangzhou. After critical analysis, it is evident that Sa’d ibn abi Waqqas and the three other Sahabas who were preaching from 616-18 were noticed by Emperor Wu-De by 618 AD. 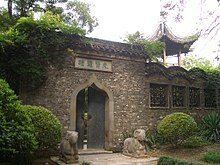 Guangzhou is home to four mosques, including the famous Huaisheng Mosque believed to have been built by Sa`d ibn Abi Waqqas, the uncle of Muhammad. The city also has a grave believed to be that of ibn Abi Waqqas (father of Sa’d ibn abi Waqqas). By the time of the Song Dynasty, Muslims had come to play a major role in the import/export industry. The office of Director General of Shipping was consistently held by a Muslim during this period. In 1070, the Song emperor Shenzong invited 5,300 Muslim men from Bukhara, to settle in China in order to create a buffer zone between the Chinese and the Liao empire in the northeast. Later on these men were settled between the Sung capital of Kaifeng and Yenching (modern day Beijing). They were led by Prince Amir Sayyid “So-fei-er” (his Chinese name) who was reputed of being called the “father” of the Muslim community in China. Prior to him Islam was named by the Tang and Song Chinese as Dashi fa (“law of the Arabs”). He renamed it to Huihui Jiao (“the Religion of the Huihui”). “On the foothills of Mount Lingshan are the tombs of two of the four companions that Prophet Muhammad sent eastwards to preach Islam. Known as the “Holy Tombs,” they house the companions Sa-Ke-Zu and Wu-Ko-Shun—their Chinese names, of course. The other two companions went to Guangzhou and Yangzhou.” “The Imam (Islamic Holy Man) Asim is said to have been one of the first Islamic missionaries in the region. His name is also spelled Imam Hashim (man of c.1000 CE in Hotan). The shrine site includes the reputed tomb of the Imam, a mosque, and several related tombs.” There is also a mazaar of Imam Zafar Sadiq. During the Mongol-founded Yuan Dynasty (1271–1368), large numbers of Muslims settled in China. The Mongols, a minority in China, gave foreign immigrants, such as Muslims, Christians, and Jews from west Asia an elevated status over the native Han Chinese as part of their governing strategy, thus giving Muslims a heavy influence. Hundreds of thousands of Muslims immigrants were recruited and forcibly relocated from Western and Central Asia by the Mongols to help them administer their rapidly expanding empire. The Mongols used Persian, Arab and Uyghur administrators, generically known as semu [色目](“various eye color”) to act as officers of taxation and finance. Muslims headed many corporations in China in the early Yuan period. [page needed] Muslim scholars were brought to work on calendar making and astronomy. The architect Yeheidie’erding (Amir al-Din) learned from Han architecture and helped to design the construction of the capital of the Yuan Dynasty, Dadu, otherwise known as Khanbaliq or Khanbaligh, the predecessor of present-day Beijing. The term Hui originated from the Mandarin “Huihui,” a term first used in the Yuan Dynasty to describe Central Asian, Persian and Arab residents in China. Statue of the famous Chinese Muslim Explorer and Admiral, Zheng He. During the following Ming Dynasty, Muslims continued to be influential around government circles. Six of Ming Dynasty founder Zhu Yuanzhang‘s most trusted generals were Muslim, including Lan Yu who, in 1388, led a strong imperial Ming army out of the Great Wall and won a decisive victory over the Mongols in Mongolia, effectively ending the Mongol dream to re-conquer China. Zhu Yuanzhang also wrote a praise of Islam, the The Hundred-word Eulogy. Additionally, the Yongle Emperor hired Zheng He, perhaps the most famous Chinese Muslim and China’s foremost explorer, to lead seven expeditions to the Indian Ocean, from 1405 and 1433. However, during the Ming Dynasty, new immigration to China from Muslim countries was restricted in an increasingly isolationist nation. The Muslims in China who were descended from earlier immigration began to assimilate by speaking Chinese dialects and by adopting Chinese names and culture. Mosque architecture began to follow traditional Chinese architecture. This era, sometimes considered the Golden Age of Islam in China, also saw Nanjing become an important center of Islamic study. 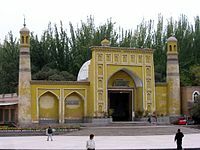 Muslims in Ming dynasty Beijing were given relative freedom by the Chinese, with no restrictions placed on their religioius practices or freedom of worship, and being normal citizens in Beijing. 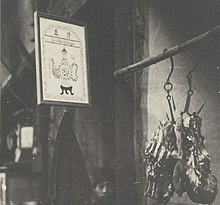 In contrast to the freedom granted to muslims, followers of Tibetan Buddhism and Catholicism suffered from restrictions and censure in Beijing. The Hui muslim population of Beijing was unaffected by the Muslim rebels during the Dungan revolt. However, many Muslims like Ma Zhan’ao, Ma Anliang, Dong Fuxiang, Ma Qianling, and Ma Julung defected to the Qing dynasty side, and helped the Qing general Zuo Zongtang exterminate the Muslim rebels. These Muslim generals belonged to the Khafiya sect, and they helped Qing massacre Jahariyya rebels. General Zuo moved the Han around Hezhou out of the area and relocated them as a reward for the Muslims there helping Qing kill other Muslim rebels. In 1895, another Dungan Revolt (1895) broke out, and loyalist Muslims like Dong Fuxiang, Ma Anliang, Ma Guoliang, Ma Fulu, and Ma Fuxiang suppressed and massacred the rebel Muslims led by Ma Dahan, Ma Yonglin, and Ma Wanfu. A Muslim army called the Kansu Braves led by General Dong Fuxiang fought for the Qing dynasty against the foreigners during the Boxer Rebellion. They included well known generals like Ma Anliang, Ma Fulu, and Ma Fuxiang. In Yunnan, the Qing armies only massacred the Muslims who had rebelled, and spared Muslims who took no part in the uprising. After the fall of the Qing Dynasty, Sun Yat Sen, who established the Republic of China, immediately proclaimed that the country belonged equally to the Han, Man (Manchu), Meng (Mongol), Hui (Muslim),[n 1] Tsang (Tibetan), and Miao peoples. During the Cultural Revolution, mosques along with other religious buildings were often defaced, destroyed or closed and copies of the Quran were destroyed along with temples, churches, Buddhist and Daoist monasteries, and cemeteries by the Red Guards. [page needed] During that time, the government also constantly accused Muslims and other religious groups of holding “superstitious beliefs” and promoting “anti-socialist trends”. The government began to relax its policies towards Muslims in 1978. Today, Islam is experiencing a modest revival and there are now  many mosques in China. There has been an upsurge in Islamic expression and many nation-wide Islamic associations have been organized to co-ordinate inter-ethnic activities among Muslims. Muslims live in every region in China. The highest concentrations are found in the northwest provinces of Xinjiang, Gansu, and Ningxia, with significant populations also found throughout Yunnan province in southwest China and Henan province in central China. Of China’s 55 officially recognized minority peoples, ten groups are predominantly Muslim. The largest groups in descending order are Hui (9.8 million in year 2000 census, or 48% of the officially tabulated number of Muslims), Uyghur (8.4 million, 41%), Kazakh (1.25 million, 6.1%), Dongxiang (514,000, 2.5%), Kyrgyz (161,000), Salar (105,000), Tajik (41,000), Uzbeks, Bonan (17,000), and Tatar (5,000). However, individual members of traditionally Muslim ethnic groups may profess other religions or none at all. Additionally, Tibetan Muslims are officially classified along with the Tibetan people. Muslims live predominantly in the areas that border Central Asia, Tibet and Mongolia, i.e. Xinjiang, Ningxia, Gansu and Qinghai, which is known as the “Quran Belt”. China is home to a large population of adherents of Islam. According to the CIA World Factbook, about 1%-2% of the total population in China are Muslims, while the US Department of State‘s International Religious Freedom Report shows that Muslims constitute about 1.5% of the Chinese population. Recent census counts imply that there may be up to 20 million Muslims in China. A 2009 study done by the Pew Research Center, based on China’s census, concluded there are 21,667,000 Muslims in China, accounting for 1.6% of the total population. An early estimate of the Muslim population of the then Qing Empire belongs to the Christian missionary Marshall Broomhall. In his book, published in 1910, he produced estimates for each province, based on the reports of missionaries working there, who had counted mosques, talked to mullahs, etc. Broomhall admits the inadequacy of the data for Xinjiang, estimating the Muslim population of Xinjiang (i.e., virtually the entire population of the province at the time) in the range from 1,000,000 (based on the total population number of 1,200,000 in the contemporary Statesman’s Yearbook) to 2,400,000 (2 million “Turki“, 200,000 “Hasak“, and 200,000 “Tungan“, as per George Hunter). He uses the estimates of 2,000,000 to 3,500,000 for Gansu (which then also included today’s Ningxia and parts of Qinghai), 500,000 to 1,000,000 for Zhili (i.e., Beijing, Tianjin, and Hebei), 300,000 to 1,000,000 for Yunnan, and smaller numbers for other provinces, down to 1,000 in Fujian. For Mongolia (then, part of the Qing Empire) he takes an arbitrary range of 50,000 to 100,000. Summing up, he arrives to the grand total of 4,727,000 to 9,821,000 Muslims throughout the Qing Empire of its last years, i.e. just over 1-2% of the entire country’s estimated population of 426,045,305. The vast majority of China‘s Muslims are Sunni Muslims. A notable feature of some Muslim communities in China is the presence of female imams. Islamic scholar Ma Tong recorded that the 6,781,500 Hui in China predominately followed the Orthodox form of Islam (58.2 % were Gedimu a non-sufi mainstream tradition that opposed unorthodoxy and religious innovation) mainly adhering to the Hanafi Madh’hab. However a large minority of Hui are members of Sufi groups. According to Tong, 21% Yihewani, 10.9% Jahriyya, 7.2 % Khuffiya, 1.4% Qadariyya, and 0.7 % Kubrawiyya. 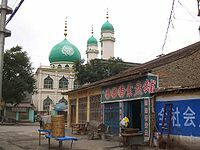 Shia Chinese Muslims are mostly Ismailis including Tajiks of the Tashkurgan and Sarikul areas of Xingjian. It is known that Admiral Zheng He (1371–1435) and his Muslim crews had made the journey to Mecca and performed the Hajj during one of the former’s voyages to the western ocean between 1401-1433. Other Chinese Muslims may have made the Hajj pilgrimage to Mecca in the centuries followed; however, there is little information on this. The General Ma Lin (warlord), made a Hajj to Mecca. General Ma Fuxiang along with Ma Linyi sponsored Imam Wang Jingzhai when he went on hajj to Mecca in 1921.Yihewani Imam Hu Songshan went on Hajj in 1925. Briefly during the Cultural Revolution, Chinese Muslims were not allowed to attend the Hajj, and only did so through Pakistan, but this policy was reversed in 1979. Chinese Muslims now attend the Hajj in large numbers, typically in organized groups, with a record 10,700 Chinese Muslim pilgrims from all over the country making the Hajj in 2007. In their early history, Muslims residing in China had closer interactions with adherents of other various faiths. Muslims treated the works of Confucius with considerable respect, pointing out the harmony between the two doctrines. Muslims saw their numbers increase in the 17th century with a large number of Chinese Jews converting to Islam. Muslim General Ma Bufang allowed polytheists to openly worship, and Christian missionaries to station themselves in Qinghai. General Ma and other high ranking Muslim generals even attended the Kokonuur Lake Ceremony where the God of the Lake was worshipped, and during the ritual, the Chinese national anthem was sung, all participants bowed to a portrait of Kuomintang party founder Dr. Sun Zhongshan (Sun Yat Sen), and the God of the Lake was also bowed to, and offerings were given to him by the participants, which included the Muslims. Ma Bufang invited Kazakh Muslims to attend the ceremony honoring the God. Ma Bufang received audiences of Christian missionaries, who sometimes gave him the Gospel. His son Ma Jiyuan received a silver cup from Christian missionaries. The Islamic Association of China claims to represent Chinese Muslims nationwide. At its inaugural meeting on May 11, 1953, in Beijing, representatives from 10 nationalities of the People’s Republic of China were in attendance. 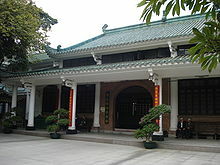 In April 2001, the government set up the China Islamic Association, which was described as aiming to “help the spread of the Qur’an in China and oppose religious extremism”. 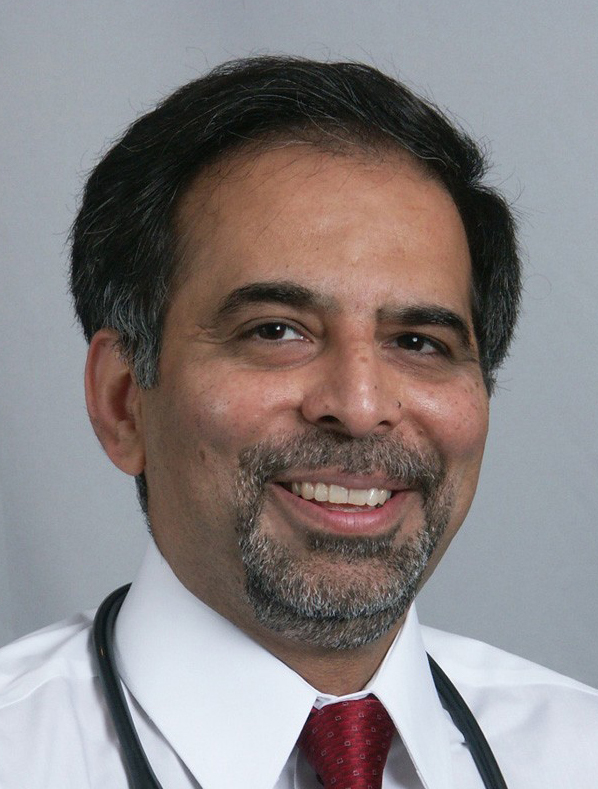 The association is to be run by 16 Islamic religious leaders who are charged with making “a correct and authoritative interpretation” of Islamic creed and canon. It will compile and spread inspirational speeches and help imams improve themselves, and vet sermons made by clerics around the country. This latter function is probably the key job as far as the central government is concerned. It is worried that some clerics are using their sermons to spread sedition. Muslims have often filled distinguished military positions, and many Muslims have joined the Chinese army. Muslims served extensively in the Chinese military, as both officials and soldiers. It was said that the Muslim Dongxiang and Salar were given to “eating rations”, a reference to military service. In Chinese, a mosque is called qīngzhēn sì (清真寺) or “pure truth temple.” The Great Mosque of Xi’an (first established during the Tang era) and the Great Southern Mosque in Jinan, whose current buildings date from the Ming Dynasty, do not replicate many of the features often associated with traditional mosques. Instead, they follow traditional Chinese architecture. 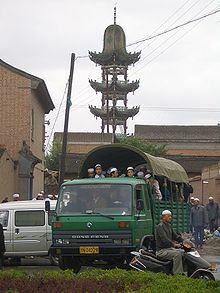 Mosques in western China incorporate more of the elements seen in mosques in other parts of the world. 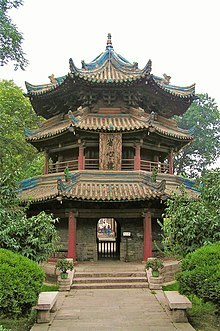 Western Chinese mosques were more likely to incorporate minarets and domes while eastern Chinese mosques were more likely to look like pagodas. An important feature in Chinese architecture is its emphasis on symmetry, which connotes a sense of grandeur; this applies to everything from palaces to mosques. One notable exception is in the design of gardens, which tends to be as asymmetrical as possible. Like Chinese scroll paintings, the principle underlying the garden’s composition is to create enduring flow; to let the patron wander and enjoy the garden without prescription, as in nature herself. On the foothills of Mount Lingshan are the tombs of two of the four companions that Muhammad sent eastwards to preach Islam. Known as the “Holy Tombs,” they house the companions Sa-Ke-Zu and Wu-Ko-Shun—their Chinese names, of course. The other two companions went to Guangzhou and Yangzhou. A typical Muslim restaurant in Linxia City. A halal meat store sign in Hankou, ca. 1934-1935. China and Chinese Muslim economists have a long tradition with Islamic finance. The latest official attempt is Bank of Ningxia; while Hong Kong as financial center is discussing intensively its role. A Chinese–Arabic–Xiaoerjing dictionary from the early days of the People’s Republic of China. Xiao’erjing (also Xiao’erjin or Xiaojing) is the practice of writing Sinitic languages such as Mandarin (especially the Lanyin, Zhongyuan, and Northeastern dialects) or the Dungan language in the Arabic script. It is used on occasion by many ethnic minorities who adhere to the Islamic faith in China (mostly the Hui, but also the Dongxiang, and the Salar), and formerly by their Dungan descendants in Central Asia. Muslim development and participation at the highest level of Chinese wushu has a long history. 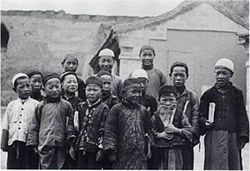 Many of its roots lie in the Qing Dynasty persecution of Muslims. The Hui started and adapted many of the styles of wushu such as bajiquan, piguazhang, and liuhequan. There were specific areas that were known to be centers of Muslim wushu, such as Cang County in Hebei Province. These traditional Hui martial arts were very distinct from the Turkic styles practiced in Xinjiang. The Han Kitab was a collection of Chinese Islamic texts written by Chinese Muslim which synthesized Islam and Confucianism. It was written in the early 18th century during the Qing dynasty. Han is Chinese for Chinese, and kitab (ketabu in Chinese) is Arabic for book. Liu Zhi wrote his Han Kitab in Nanjing in the early 18th century. The works of Wu Sunqie, Zhang Zhong, and Wang Daiyu were also uncluded in the Han Kitab. For some Muslim groups in China, such as Hui and Salars minorities, coeducation is frown upon; for some groups such as Uyghurs, its not. Liu Bin Di was a Hui Kuomintang officer who died while fighting against Uyghur rebels in the Ili Rebellion. Ma Xinyi, official and a military general of the late Qing Dynasty in China. Zuo Baogui (左寶貴) (1837–1894), Qing Muslim general from Shandong province, was martyred in Pingyang in Korea by Japanese cannonfire in 1894 while defending the city. A memorial to him was built. Wang Daiyu, Master Supervisor of the Imperial Observatory during the Ming Dynasty. He was called ‘Master of the Four Religions’ because of his complete knowledge of China’s four religions: Islam, Buddhism, Taoism and Confucianism. Wang Zi-Ping, member of an underground revolutionary group known as “The Righteous and Harmonious Fists” during the Boxer Rebellion. Chang Tung Sheng, martial artist and Shuai jiao teacher. ^ Bentley, Jerry H.; Ziegler, Herbert (2007). Traditions and Encounters: A Global Perspective on the Past. McGraw-Hill. p. 586. ISBN 0073406937. ^ Safi-ur Rahman Al-Mubarakpuri, 2009, Ar-Raheeq al-Makhtum: The Sealed Nectar: Biography of the Noble Prophet, Madinah: Islamic University of Al-Madinah al-Munawwarah, page 72. ^ Susan Naquin (2000). Peking: temples and city life, 1400-1900. University of California Press. p. 214. ISBN 0520219910. Retrieved 2010-11-28. ^ Hugh D. R. Baker (1990). Hong Kong images: people and animals. Hong Kong University Press. p. 55. ISBN 9622092551. Retrieved 2011-06-19. ^ Allès, Elizabeth (september-october 2003, Online since 17 january 2007). “Notes on some joking relationships between Hui and Han villages in Henan”. French Centre for Research on Contemporary China. p. 6. Retrieved 2011-07-20. ^ Counting up the number of people of traditionally Muslim nationalities who were enumerated in the 1990 census gives a total of 17.6 million, 96% of whom belong to just three nationalities: Hui 8.6 million, Uyghurs 7.2 million, and Kazakhs 1.1 million. Other nationalities that are traditionally Muslim include Kyrghyz, Tajiks, Uzbeks, Tatars, Salar, Bonan, and Dongxiang. See Dru C. Gladney, “Islam in China: Accommodation or Separatism?”, Paper presented at Symposium on Islam in Southeast Asia and China, Hong Kong, 2002. Available at http://www.islamsymposium.cityu.edu.hk. The 2000 census reported a total of 20.3 million members of Muslim nationalities, of which again 96% belonged to just three groups: Hui 9.8 million, Uyghurs 8.4 million, and Kazakhs 1.25 million. ^ “Mapping the Global Muslim Population.” Pew Research Center. October 2009. See pages 13 and 45. ^ Broomhall 1910, p. 214 Quote: “No definite information has been received concerning Mongolia”. ^ American Water Works Association (1947). Journal of the American Water Works Association, Volume 39, Part 1. The Association. p. 24. Retrieved 2010-06-28. ^ HORLEMANN, BIANCA. “The Divine Word Missionaries in Gansu, Qinghai and Xinjiang, 1922–1953: A Bibliographic Note”. Retrieved 2010-06-28. ^ James Hastings, John Alexander Selbie, Louis Herbert Gray (1916). Encyclopædia of religion and ethics, Volume 8. T. & T. Clark. p. 893. Retrieved 2010-11-28. ^ Christian Literature Society for India, Hartford Seminary Foundation (1920). Samuel Marinus Zwemer. ed. The Moslem World, Volume 10. Hartford Seminary Foundation. p. 379. Retrieved 2011-06-06. ^ Jonathan Neaman Lipman (2004). Familiar strangers: a history of Muslims in Northwest China. Seattle: University of Washington Press. p. 79. ISBN 9050295976446. Retrieved 2010-06-28. ^ Ruth Hayhoe (1996). China’s universities, 1895-1995: a century of cultural conflict. Taylor & Francis. p. 202. ISBN 0815318596. Retrieved 2010-06-29. ^ Aliya Ma Lynn (2007). Muslims in China. University Press. p. 44. ISBN 0880938617. Retrieved 2010-06-28. Broomhall, Marshall (1910), Islam in China: a neglected problem, China Inland Mission, OCLC 347514. A 1966 reprint by Paragon Book Reprint is available; written with a strong Christian missionary point of view, but contains valuable first-hand evidence and photographs. Ferm, Vergilius, ed. (1976), An Encyclopedia of Religion (reprinted ed. ), Westport, CT: Greenwood Press, ISBN 9780837186382; first published as Ferm, ed. (1945), New York: Philosophical Library, OCLC 263969. 1976 reprint is unrevised. Islam in China, Hui and Uyghurs: between modernization and sinicization, the study of the Hui and Uyghurs of China, Jean A. Berlie, White Lotus Press editor, Bangkok, Thailand, published in 2004. ISBN 9744800623, 9789744800626. This article incorporates text from Encyclopædia of religion and ethics, Volume 8, a publication from 1916 now in the public domain in the United States. This article incorporates text from The Moslem World, Volume 10, a publication from 1920 now in the public domain in the United States.